Comments: CD only. Book not included. Proven seller with Excellent Customer Service. Choose expedited shipping and get it FAST!!! 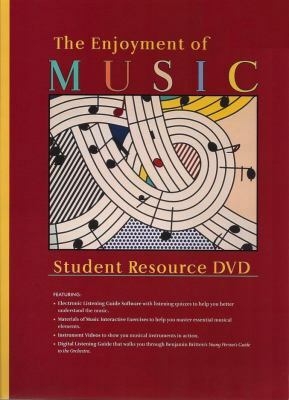 Used by over 3.5 million students, 'The Enjoyment of Music' has been the most trusted introduction to music for over five decades. The tenth edition reaffirms this status in a thoughtful revision offering a more diverse repertory and a stronger emphasis on the cultural significance of musical styles and periods.Kristine Forney is the author of 'Student Resource DVD: for The Enjoyment of Music: An Introduction to Perceptive Listening, Tenth Edition', published 2007 under ISBN 9780393107579 and ISBN 0393107574. Loading marketplace prices 79 copies from $0.01 How does the rental process work?